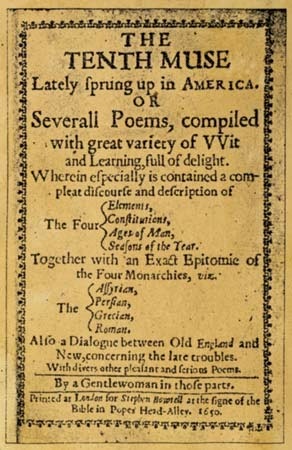 Anne Bradstreet, Yet Another "Tenth Muse"! Anne Dudley was born in England on 20 March 1612, the daughter of Thomas Dudley and Anne York. Although the younger Anne was not formally educated, her father was the steward of the earl of Lincoln, and she had access to the library there, where she read Greek and Roman classics, from Hesiod and Homer to Virgil and Seneca, and English writers like Spenser, Sidney, and Milton. Anne Dudley married the Puritan Simon Bradstreet when she was sixteen. In 1628, Anne's father was involved in forming the Massachusetts Bay Company; in 1630, she and her husband immigrated to the new Massachusetts Bay Colony with her parents. Both her father and her husband would become governors of the colony. Anne herself would give birth to eight children between 1633 and 1652. She would also write, becoming the first woman writer published in North America. Her earliest poem is dated to 1632, "Upon a Fit of Sickness." A volume of her work, titled The Tenth Muse, Lately Sprung up in America, was published in London in 1650, ostensibly without her knowledge. The book was first published in America in 1678, after her death on 16 September 1672, as Several Poems Compiled with Great Wit and Learning. For Wendy Martin's excellent biographical essay on Anne Bradstreet and Martin's introduction to Bradstreet's work, click here. This material, from the website of the Poetry Foundation, includes a bibliography and a generous sampling of Bradstreet's poetry.